Narcissus, violet leaves, galbanum, carnation, patchouli, ambergris accord, leather, moss and musk. Three things strike me about Myths’ opening minutes on my skin. 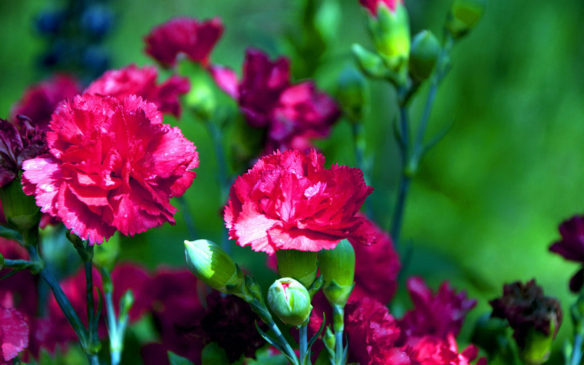 First, the spicy, fiery, quietly peppery carnations are given a refreshing iciness that evokes the arctic floral blast you get upon opening a florist’s refridgerator. Second, the flower’s scent is captured from head to toe. Its petals drip with dewy wetness, while the body is ensconced amidst the leafy greenness of galbanum and violet leaf, oozing a wonderful, sappy bitterness from cuts to its stem, and growing out of wet, black soil. Other elements are noticeable as well. Strands of narcissus are sprinkled on top of the bouquet, smelling like dry hay, while rivulets of darkness snake through the base, feeling almost as leathery as they do mossy and earthy. I think there is a good dose of icy, wet chrysanthemum in Myths’ opening as well, even if Amouage does not mention the flower in the official list. Fragrantica does, however. While they sometimes make mistakes and a brand’s official note list should always trump as a general rule, I think Fragrantica is right in this instance; something about Myths’ chilly floralcy harkens to Serge Lutens’ metallic, silvered chrysanthemums in De Profundis. Myths’s opening changes quickly in its nuances and feel. After roughly 15 minutes, the arctic blast of the florist’s case begins to weaken, turning more moderate as the scent turns a hair warmer, thanks to a trickle of amber rising up from the base. The carnation and chrysanthemum continue to have a refreshing coolness, but they’re now infused with a lick of warmth as well. Around the same time, the narcissus’ strands of hay disappear into the background, then vanish entirely not long after. Taking its place is grey, mineralized lichen that sprouts up in a faintly musty layer atop the loamy, wet, black earth in the base. Before long, Myths has become a heady mix of warm and cool, red and green, centered on the fiery, spiced sweetness of a carnation draped in folds of velvety, leafy, earthy, leafy, and bitter green. 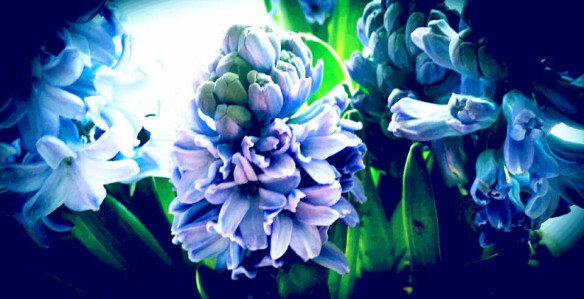 The impressionistic sense of “hyacinth” eventually fades away as the first hour progresses, but rivulets of sappy bitterness continue to snake around the edges, as the galbanum grows in strength. Something about it reminds me of the Evil Queen’s poison in Snow White’s red apple. As Myths Woman develops, a different impression takes hold. In all four of Amouage’s last releases, beginning with Sunshine Woman, I’ve noticed a sort of olfactory dark eclipse that sweeps over the core bouquet as the perfumes develop. Sometimes it’s peppery; sometimes it’s leathery or smoky; once in a while, it’s dry woodiness tinged with smoke; and frequently, it’s some combination of several of the above. Even Opus VIII back in 2014 had an interplay of darkness and dryness juxtaposed against its bright white flowers, albeit to a far lesser extent than Sunshine Woman where the movement of an eclipse was an official, explicit inspiration. In my opinion, the eclipse sweeps over Myths Woman and Man, too. 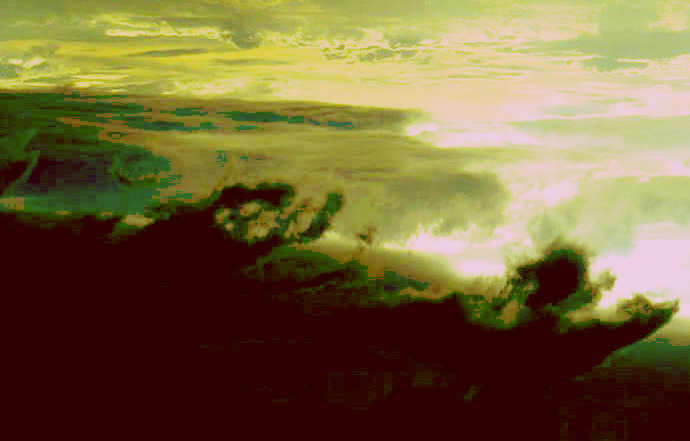 In Myths Woman, the darkness appears in the second stage, starting roughly 1.5 hours into the fragrance’s development. In essence, Myths pivots from a dewy, chilly, spicy, green floral to a dry, smoky, and mostly leather-laced green floral. The change becomes particularly noticeably at the start of the 3rd hour when the carnation turns diffuse and sheer, a mere vapor that curls around a new core of increasingly parched leather atop a base of mossy, earthy, and leafy greenness. By the 4th hour, the carnation-chrysanthemum accord actually recedes to the background, leaving only a peppery floral spiciness trailing behind it, as the violet leaf takes its place beside the leather. In fact, something about the mix of smoky leather with greenness and spiciness reminds faintly me of parts of Fahrenheit, Dior’s men’s cologne. To be clear, I’m not saying the fragrances are identical, and it’s not a huge, overwhelming resemblance, merely a tenuous thought. 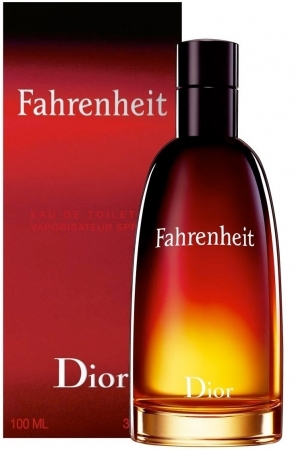 Myths is not intensely balsamic, ambered, woody, warm, and rich like (vintage) Fahrenheit was when I wore or smelt it back in the early 1990s. Instead, it’s a sheer, surprisingly soft vapor, one that skews predominantly green and excessively dry, neither of which are things that I associate with Fahrenheit. I think of spicy, rubbery, diesel leather above all else, enveloped in a golden-red haze of amber and spice, and I never think of its violet leaf greenness. Be that as it may, it must have left a subconscious mark because the Dior fragrance came to mind a few times during Myth’s violet leaf-leather middle stage, even if it was merely a passing suggestion. Regardless, all thought of Fahrenheit disappears when Myths’ 3rd stage begins at the start of the 7th hour. Essentially, the notes realign in order, prominence, and strength, as Myths’ floral core slowly reasserts itself over the darkness. The carnation begins to crawl from the background towards the center stage, while the leather becomes a minor wisp at the sidelines, leaving only a trail of dry smoke behind it to bind the violet leaf. The result is a dry, spicy, peppery floral bouquet with a quiet carnation identity, laced with a sharp, violet leaf greenness and a smidgen of leathery smoke, all lying atop a faintly mossy, vaguely earthy base. It’s still more of the dry, smoky Opus twist on florals, and still a predominantly green scent, but the eclipse has passed. What fascinates me about Myths Woman is how it eventually cycles back to its opening bouquet, give or take a few nuances, during its drydown. Somewhere around the 10th or 11th hour, depending on test and how much fragrance I apply, Myths Woman begins to morph back into a cool, fiery carnation scent surrounded by soft green leaves, and licked with ambered warmth. A new element provides the finishing touch, a clean but slightly benzoin-ish powderiness. The carnation bouquet is an unexpected 180 reversal, although far softer than it was at the start and, eventually, significantly more ambered, too. In fact, the amber emerges more and more during the second half of the drydown, first blurring the edges of the green floral, then swallowing it entirely. By the time the 13th hour rolls around, Myths Woman has become a lightly powdered, petal-soft haze of ambered warmth etched with thin ribbons of spicy, peppery carnation. Those ribbons slowly grow thinner, shrink, and finally, turn a mere whisper, leaving Myths as nothing more than spicy, lightly powdered goldenness with only a hint of something floral about it. It’s lovely, and incredibly long-lasting. Myths Woman has great longevity on my skin, but it’s surprisingly sheer and soft for an Amouage fragrance, in my opinion. Using several wide smears equal to 2 good sprays from a bottle, the fragrance typically opens with about 4 inches of projection and about 6 inches of sillage. The scent feels sheer, lightweight, and thin in body at first, a sort of strong weightlessness. While Myths Woman does deepen and grow richer at the start of the 2nd hour, it’s a relative thing. The projection and scent trail certainly drop quite fast, becoming 2 inches and roughly 3-4 inches, respectively, after 90 minutes. Roughly 2.5 hours into its development, the sillage lies close to the skin, perhaps 2 inches at most, while the projection is between 1 and 0.5 inches. After 4 hours, Myths Woman hovers just above the skin, not quite a skin scent, but almost. It turns into an actual skin scent 5 hours into its development, although the fragrance is easy to detect if I bring my nose close to my arm. By the 9th hour, I was actually surprised the fragrance was still there, but it hangs on with astonishing tenacity, even if I had to work to detect it. In total, Myths Woman typically lasts 15-17 hours with the equivalent of 2 sprays, but only 12-14 hours with only one. I think it’s one of those scents with a deceptively long tail-end, but such discreetness or softness after the first half that it’s not readily apparent. Early reviews for Myths are ambivalent or mixed. On Fragrantica, only two people have tried it and written about it at this time, and neither one is enthusiastic. One calls it a “strange” fragrance with “discordant” notes dominated by greenness. The drydown was powdery, and the fragrance lay close to the skin. The second poster, “Myra83,” had a similar experience, describing Myths as a combination of Amouage’s Ciel Women with the greenness of Opus VII, before it took on the light, fresh, powdery, cleanness of Dia Men. What she was most negative about was Myths’ softness, calling it the “lightest” scent for the price, and suggesting that you wear it if you wanted an undetectable fragrance. She wrote that Myths became a skin scent on her after two hours. A cool, dark, damp shade where bitter, humid greens proliferate over a rich, peaty soil riven with mycelial rhizomes. Buttery, dense (but obscure) floral notes hang heavy in the air. This is the opening of Myths Woman, a perfume which seems to be seeking to unite swamp vegetation with hints of the decay upon which it grows. With time the dry moss note in the base becomes more pronounced and the composition becomes airier. This is a cool, green floral chypre but with a bold counterpart of soil and decay. I enjoy such things, but I suspect many will not. I do not, however, enjoy them enough to justify the price, which would require mad love. Other than the longevity we both experienced, Myths was obviously quite different on me, and, yet, I understand a lot of what he wrote and I think the perfume is constructed in such a way that, depending on a person’s individual skin chemistry, things could go either way, either like my version or his. Take his comments about the opening where he was struck by a sense of “bitter, humid greens,” peaty earth and vegetation. Those elements were weaker on me, but they definitely exist to some degree. It’s the same thing with his view of Myths as a “cool, green floral chypre but with a bold counterpart of soil and decay.” I experienced a cool, green leather-floral instead of a chypre during the middle stage, with smoke in lieu of “decay,” but I think Myths could easily go either way on people, depending on skin chemistry, because of the copious amounts of violet leaf greenness, bitter galbanum, oakmoss, and earthiness (via the patchouli). When you take Myths as a whole, from start to finish, those green elements are ultimately far stronger, more dominant, and more persistent than the dry, smoky leather I experienced during the “eclipse” of the middle stage. It’s something to keep in mind if my description of the latter turned you off, and if you prefer chyprish scents to leathery florals. Myths Woman is not my personal cup of tea, but I think it has some enjoyable bits. I didn’t loathe it like I did the two Sunshines or Opus IX, I think it’s a more interesting scent in comparison, and it definitely feels niche in style. Admittedly, my fondness for carnation (and chrysanthemum) plays a role in some of those assessments because neither one is as common as white florals. Having said that, I far prefer Amouage’s old or original style of perfumery. Christopher Chong continues to head in a very different direction. So, for me, the best Amouage of recent years remains 2013’s gorgeous Fate Woman, and I’ll pass on Myths Woman, but you should try it for yourself if you love carnation, green florals, green floral leathers, or green leather-chypres. Cost & Availability: Myths for Women is an eau de parfum that comes in two sizes: a 50 ml bottle for $280, €235, or £175; and a 100 ml bottle for $330, £275, or €205. In the U.S.: Luckyscent has Myths, sells samples, and ships worldwide. OsswaldNYC and Twisted Lily should get it soon, so I’ve linked to their general Amouage pages for you to use at that time. Outside the U.S.: In Canada, Myths is sold at Etiket. For all parts of the world, you can order directly from Amouage. (Shipping is from the UK.) The Locations tab at the top of the page will give you the price for your country. Harrods doesn’t have Myths at the time of this post, but should get it soon. On the continent, Myths is already at ParfuMaria and Italy’s Neos1911 in both sizes. Premiere Avenue only has it in the 100 ml bottle. First in Fragrance will get Myths on June 30th, but offers a pre-order option now. Essenza Nobile and Jovoy carry Amouage, but they do not have either Myths fragrance listed on their websites at the time of this review. 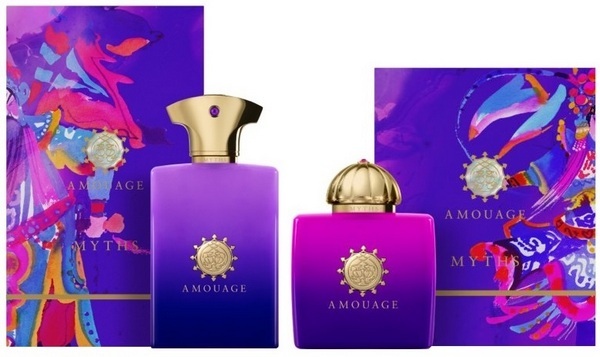 I’ve given links to their general Amouage pages for you to use later. Myths should be at all Amouage niche retailers and the high-end department stores that typically carry the line by the end of June. Samples: A number of the sites above sell samples. Surrender to Chance sells Myths Woman starting at $3.99 for a 1/2 ml vial. This entry was posted in Amouage, Florals, Green Fragrances, Perfume Review and tagged Amouage, Amouage Myths for Women, Amouage Myths fragrance review, Amouage Myths Woman review, Amouage womens Myth review, Carnation fragrances, Dior Fahrenheit, Floral leathers, Myths Women fragrance review by Kafkaesque. Bookmark the permalink. This sounds like it is right up my alley; however, even I would proceed cautiously with some free sniffs first before any purchase. I find it amazing that this lasted on you for a long time! Since you did not mention Iso-e-Supercrappy (TM) or any aromachemical, I assume whatever may have been used was at a lower than low amountl? I have the sneaking suspicion that there is ISO E, but it’s not détectable in any loud, clanging way or with a chemical scent. The leather’s smoke and the general parched dryness are definitely synthetic, though. By the way, the vast majority of longevity votes on Fragrantica are for Long lasting and Very Long lasting. It’s a landslide at 8 votes as compared to the only other category chosen, one single vote for Weak. Since Very Long Lasting is defined at 12 hours-plus, I don’t think the longevity I experienced was any sort of aberration. But the projection and sillage definitely seem to be on the weak, soft side — for most people, from what I’ve read and heard. Thank you for the review, It looks like I will stay away from this one. I am starting to get into Amouage and have been impressed by the attars shared by the nice members on the forum. Some of the fragrances I have tested smell mainstream (boring)… the attars blew me away! Other than Fate, can you also recommend some other fragrances from Amouage that smells exotic and Arabian? I can’t remember the notes you love/hate or the fragrances genres you gravitate to, but I’m happy to make a few suggestions. First, though, let me say that there’s nothing like the attars, nothing that glorious, so you should rid your mind of any expectations of finding something similar. Second, in the regular line, you should know that the Men’s and Women’s versions of each duo differ quite a bit in feel. The Men’s is typically drier and/or darker, the Women’s lusher and richer. Third and finally, please be aware that most all the older releases have been reformulated by now. Out of the Opus line, which tends to be much, much drier than the regular one and occasionally more abstract in nature, if you like very animalic, very green, intensely dark, and urinous scents, you may want to consider Opus VII. (I’m not keen on it.) Opus VI is the one mostly amber scent, but I’m not enthused. I haven’t tried any of the ones prior to VI. Thank you for this review. You’ve just confirmed what I was thinking recently: I do not like the direction in which Mr. Chong takes Amouage and, I think, Myths was the last Amouage sample, for which I paid. Oh well… I think I could survive at least a couple of years on all classic Amouage perfumes in my collection – so I shouldn’t complain (but should stop paying for disappointments 🙂 ). You’re very welcome, Undina. What is Myths like on you? You know, I was thinking about you about a week ago with regard to Ubar. Someone had asked me for some recommendations for old Amouages, and you always come to mind when I think about that fragrance. 🙂 Lyric, too, although not quite so much as Ubar. Both of them, though, are so very different in style or aesthetic to something like Myths Woman…. Ubar, Lyric, Dia, Gold and Epic – these are my staples, I could probably use the first 4 in my top 10 all-time favorites. With Myths… I’m not really good with figuring out notes but I do smell carnation and I tend to agree with you and Fragrantica on chrysanthemum. While I like both these notes in SL’s perfumes, here they just do not mix well for me. Narcissus, which I also rather like, overpowers the opening for me. And, to my disappointment, I can’t smell galbanum, which I love, at all. So while it’s not as awful as Sunshine on my skin, I’m very disappointed with the trend in general: why wasn’t it enough to create a new line (Opuses)? Why did they have to mess with the style of the main line? There are hundreds of modern European perfumes launched every month – why not to stick to the original style?! I think you explained things very well, giving me a good sense of how Myths is on your skin, so I think you should trust your nose and powers of explanation more, my dear. 🙂 It’s interesting that the narcissus overpowers the opening on you; someone else had a similar experience. 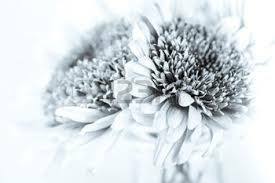 BTW, do you know that when I smell chrysanthemum the way it in in De Profundis or, in fact, anything like De Profundis (not that there are many things that are even close), I always think of you? Did you hear that it’s been reformulated? And not well at that, according to what several of my readers have told me, alas. You and I shall have to hoard our bell jars of it. What a marvelous review! You captured every facet of this (I think) stunning creation. While it may not be classic “Arabian” it is, to my nose, classic perfumery as it once was in the the 40’s and 50’s. The florals are so rich and buttery and natural floating above the hum of castoreum and civet that my eyes roll back in my head. I have Dia, Gold, Ciel, Ubar, Reflection and pulled the trigger on Myths before my sample had barely dried, with no regrets I might add. I am nervously eyeing my sample hoping I don’t go through it before my 100 mls arrive! I agree wholeheartedly about Sunshine by the way. If I didn’t know better, I would never have believed it was an Amouage, or even anything other than a drugstore ‘fume. They need to scrap that one right away! Thanks for giving this lovely new creation its due.